Managed to find time today to sow the first batch of Medwyns re-selected kelsae Exhibition onions. Only about 50 seed in the packet so I hope they germinate at 5 quid a packet. Again I used chestnut compound just to be on the safe side, and I have placed the trays on my warming cable beds. As soon as they germinate I will leave them in the main greenhouse with a minimum night temperature of 50f. I will leave one tray under lights as a test but I'm sure my light is to strong for onions, the rest will grow in natural daylight which will produce big bulbs anyway and is probably a safer bet for now. I will plant my next batch of onions in about 10 days time. Spent Saturday cleaning all the pots for my shallots and preparing the compost. I have gone for 4lt pots and just a general multipurpose compost with added calcified seaweed. A small indent is made in each pot ensuring I don't compact the compost in anyway and the shallot is just placed on top. I suppose I have about 90 shallots this year in pots which are sitting in my smaller polytunnel, all I need do now is keep the frost off them with some fleece and keep an eye on pests and watering. Aphids can be a problem even in winter so you really need to keep your eye out for them. My leeks have now rooted well and the roots can be seen in the pots, so they have got off to a good start. Bubils should be pearly white at the base and I'm always slightly concerned when I receive mine from Medwyns as most have a brown colour on them, but he knows what he's doing right?, so I hope I don't have any problems with them as they receive the most care and everything is so clean and sterilized the greenhouse stinks. I have now also removed the split canes and supports because at this young stage once rooted they don't need them and will actually grow straighter without them. Sometimes the support clips can actually hinder them to one side and I like to take them off at this stage because they won't fall over now and should grow naturally straight, The support clips are replaced once I pot them off into 3inch. Christmas will soon be here and this is when I start to sow the first of my large exhibition onion seed. I have my own re-selection of kelsae onion, and Medwyns kelsae re-selection. I will probably sow my first batch 20-21st December, if not then I normally sow them 26-27. It takes about 10 days for germination in the right conditions from which I will prick them out gentle at the crook or as some say the bent/loop stage. Many growers have a difference of opinion on this and over the years this changes with some people preferring to leave them until they have one true leaf. It really is preference and experience, If you feel confident you can prick them out at the crook stage with out damaging them, then I feel this is the best option as they have only one root which with some care wont be damaged. If you leave them longer they will have more roots and risk damaging the root system but the plant itself will be stronger. You can of course plant them in small individual cells or plugs and you won't need to disturb them at all. 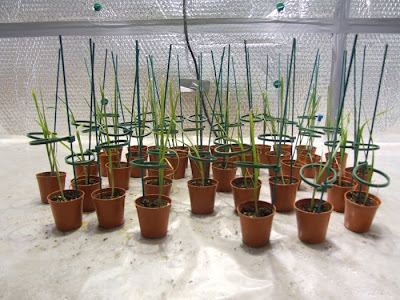 I tried this last year but I actually found the seedlings I pricked out grow faster than the ones in the cells, this is probably because I sowed them in seed base compost and pricked out into John Innes No.2, the onions in the cells of course spent longer in a weaker mix. I do honestly feel pricking them out at crook stage results in faster rooting, so I will stick to this. Shallots traditionally are planted on the shortest day of the year, so I will plant mine from the 20-23 December. Of course the weather is not right to plant them outside so they are planted in 4 litre pots and put inside one of the tunnels. You don't need to keep them warm just keep the frost off them, heat will just cause them to grow fast which is not what you want. I don't bother planting them in small pots and potting them up, waste of time if you ask me, has advantages but not enough to waste me hours and hours of time. All I do is plant them in Levingtion m2 or multipurpose with some added calcified seaweed, keeping them on the dry side until they really start to grow away. Normally there is no need to water for the first month or maybe two if you have sufficient moisture in the compost before you plant them. One vital tip is ensure you prepare your bulbs prior to planting, check them over for damage, rot, Disease, remove loose skins and any roots and do not under any circumstances push the bulbs into the compost, this causes the roots to grow upwards. Instead make an indent and place the bulb on top, remove any bulbs once rooted that look suspicious. Well my leeks turned up on the 10th Dec this week and this is really where my season starts. As soon as they root they will stand bolt upright and I will start to gently manipulate them to ensure they are straight. They look poor at the moment but this is to be expected as they are delivered it stands to reason they get a check. Also one point of note: I water my leeks with tap water at the grow room temperature, Rain water is acidic and not always clean so I prefer not to take the risk especially with leeks that are prone to all sorts of virus and fungal diseases that will spread and ruin your season. I thought long and hard about what compost and mix to use this year and finally i decided to go for something that I could easily get hold of and have opted for Levington multipurpose with added vermiculite. I did consider levington m2 but this is expensive and only available via mail order. You can of course just buy westlands Irish moss peat and mix it with chempak potting base to the recommended amount and this in theory gives you m2. As I pot on I will add soil to the mixture, again I'm going for the levington organic range. Also this year I have used chestnut compound, watering before and after potting the leeks. I also spray the leeks with this and mix half strength diathane and half strength bug clear to a sprayer for a final spray. In the grow room the air temperature is ideal at 60f, with a bottom heat of 70f. I spent a week messing about with the light, heaters and fans to achieve as near as possible. Have run into a few problems with this; No heater is required from 4pm-4am as the light is on and provides a constant 60-64f with the greenhouse ventilation system opening at 66f. The heater decides to come on anyway now and again for no reason and I have tested 3 brand new heaters..hmm. If i set it on a thermostat during the day at 60f it will still heat the greenhouse another 15f when the light comes on at 4pm for no reason. If i turn the heater down then day temperature drops to 50f but the night temperature stays even 60f with a max of 67f. Really struggling to work out why this does this. Day temperature minimum: 60f Maximum: 61f. Heater doesn't realize light makes heat and still cuts in lol. Heater then proceeds to heat greenhouse up to 70f???. I thought these bloody things were suppose to know when a temperature is reached, caused me hassle all week. Only thing I can think of is maybe a draft somewhere? The heater is about 3 foot off the ground, maybe its colder down there?.